We can provide FREE DELIVERY for Zone 1 only. For all other areas there will be a surcharge. If your delivery address is not located in Zone 1 (as detailed below) please use the ‘Calculate Shipping’ option on the Shopping Cart under ‘Cart Totals’ to enter your delivery postcode to see the shipping cost before checking out. If you are in any doubt, please contact us before you commit to buy, so we can confirm the delivery cost to you. 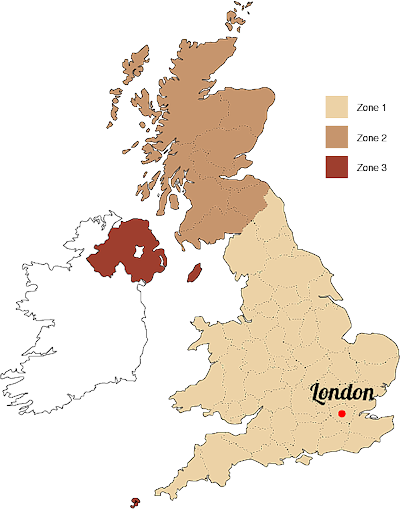 Zone 1 – England, Wales and parts of Scotland (excluding Highlands and Islands). Zone 1 is made up of all postcodes not mentioned in Zones 2 and 3 below. Zone 2 – The Highlands and Islands of Scotland – postcodes IV, HS, KA27-28, KW, PA20-49, PA60-78, PH17-26, PH30-44, PH49-50, ZE. Zone 3 – Northern Ireland, Isle of Man and Isles of Scilly – postcodes BT, IM, TR21-25. Please note: we classify the Channel Islands as an International destination. All timber orders will be delivered to the nearest access point at the delivery address, and the seller or its independent couriers will not be responsible for further movement of the goods. It is the buyer’s responsibility to advise the seller of any restrictions regarding access to the required delivery address at the time of ordering or prior to the goods being despatched. The buyer will bear the cost of any re-delivery charges incurred as a result of not informing the seller of access restrictions to the delivery address. Delivery is usually made to zone 1 postcodes within 2-3 working days of receipt of order. Other zones may take a little longer. Any delivery date or delivery time quoted is for guidance only, and the seller shall not be responsible for any costs incurred by the buyer in the event of late delivery. Should the buyer be unavailable to accept the goods at time of delivery then the buyer shall bear the cost of any re-delivery. Deliveries will be made between 8:00am and 6:30pm. The seller is unable to give an estimated delivery time as all deliveries are at the courier’s discretion. The couriers used by the seller do not offer a pre-delivery phone call service and cannot, therefore, contact the buyer directly. The buyer must examine all goods on delivery in case any damage has occurred in transit. The driver should be notified immediately of any problems and the delivery note should be signed accordingly. The seller quality controls all the products before dispatching. The seller cannot guarantee to replace or repair items that have been signed for in good condition and are later found to be damaged. This does not affect the buyer’s statutory rights. Where the buyer has received their order and no longer requires all or part of the order, then this may be returned at the discretion of the seller. If a return is agreed then the buyer must arrange transport to the seller’s premises at the buyer’s expense whereupon the seller will decide what, if any, credit is due after inspecting the goods. if the buyer receives incorrect goods they should inform the seller within 48 hours. The seller will then arrange collection of the goods for return to the seller’s premises. Upon receipt the seller will inspect the goods and, if the items are sub-standard or incorrect, will either refund the buyer or replace the goods. Where the buyer has used or installed the goods then such use or installation shall be taken as conclusive evidence that the buyer has accepted that the goods are in perfect condition. The buyer is responsible for checking that the goods are suitable for purpose. Under the Distance Selling Regulations the buyer has the right to cancel their order for any item purchased at any time before the goods are despatched, or within 7 days of receiving the goods, for a full refund excluding the cost of return shipping providing the buyer takes reasonable care of the goods whilst they are in the buyer’s possession. This does not affect the buyer’s statutory rights as a consumer. If the buyer chooses to cancel their order at any time later than the 7 days following receipt of the goods, there will be a restocking and administration charge of 20% of the value of the cancelled item. The buyer is welcome to return any items using their own courier or alternatively the seller can offer a collection and return service. The cost for return transport will be quoted on request. The seller will refund the buyer’s payment within 14 days of the goods being returned. If the buyer wishes to cancel the order, the seller must be contacted in writing via email to sales@premiumtimbers.co.uk or by post to the address provided.